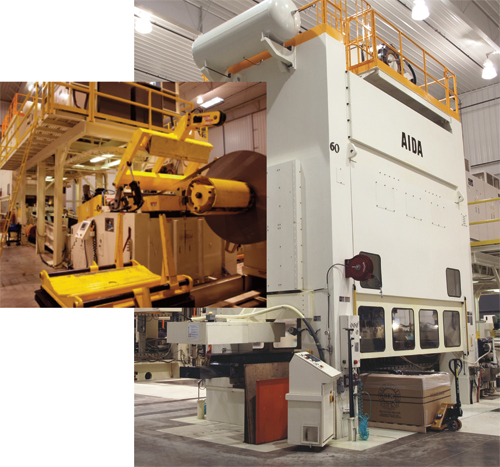 Batesville Tool & Die invested $10 million to build a new addition to its 255,000-sq.-ft. plant and acquire two new big-bed presses, including this Aida 800-ton two-point servo-drive press. The addition boasts a ceiling height of 32 ft. to accommodate larger presses, and an expandable under-floor scrap conveyor that moves scrap outdoors. A Coe servo-feed line delivers material to the press from 72-in.-dia. coils; material capacity is 0.090 in. thick by 60 in. wide to 0.312 in. thick by 12 in. wide. “Figuring it out,” as Fledderman says, often means leveraging new technology, well before many other stampers make the same leap of faith. 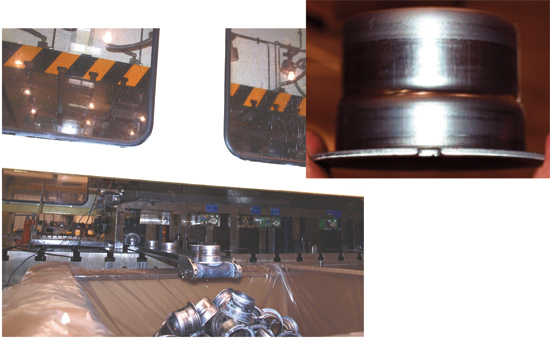 Such is the case with BTD’s most recent investment, an 800-ton Aida servo-drive press. It’s the kingpin of the company’s most recent expansion, its first-ever “strategic expansion,” says Fledderman, to allow for future work. This as opposed to the capacity-driven expansions company managers had become familiar with in the past. Technology came not just in the of the servo press, but also via a 1200-ton conventional straightside mechanical press. It’s outfitted with a three-axis servo-transfer system, the firm’s first press-mounted servo system. Previously, it ran all transfer dies using die-mounted servo systems. 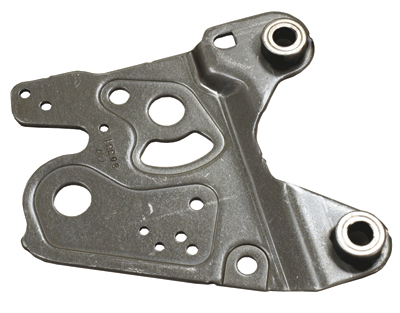 The servo-drive press stamps these seat side brackets, of 0.156-in.-thick 80-KSI high-strength low-alloy steel, two-out from 15-in.-wide strip over 10 die stations. While stamping the brackets on a conventional press created excessive snapthrough, the flexibility and controllability of the servo-press has reduced snapthrough to a manageable 55 reverse-tons. Flatness on the part’s coined sections has been improved, and press speed has increased by more than 15 percent. Fast-forward to mid-2011 and it’s no surprise that Fledderman, his brother Jay (vice president of manufacturing) and the rest of the BTD management team saw servo-drive press technology as a ticket to a brighter future. Describing the first production job run on the servo-drive press, Jay Fledderman describes the productivity and quality gain realized from moving a progressive die from a conventional 1200-ton press to the servo-drive press. BTD moved this deep-drawing job from a standard mechanical press to its servo-drive press and enjoys more than a 20 percent increase in throughput as a result. The servo press runs the part, of 0.085-in. cold-rolled steel, in the pendulum mode at 52 strokes/min. Critical tolerances are the ID/OD, formed to ±0.006 in. Watch this press run by viewing a 2-min. video in our Multimedia Center. Moving the part to the servo-drive press and redesigning the process to reduce ram speed at certain portions of the stroke, during piercing and coining, brought snapthrough down to a manageable 55 reverse tons. “We’ve found the press to be extremely adjustable in terms of how many times within each stroke we can specify ram speed,” says Robert Holtel, vice president of tooling. “This capability not only helps with snapthrough, but it also improves flatness on coined sections of the bracket, and has reduced the amount of adjustments we need to make within the tool for the form shape. Before, the hit at the bottom of the stroke was so brief that we had to overform to control part dimensions on springback. This proved very inconsistent. To get servo-press-like performance on the 1200-ton mechanical press, we would have had to add a couple of restrike stations to the die. The BTD team also showed us another job moved to the servo-drive press from a standard mechanical press —deep drawing a high-volume (2 million/yr.) automotive part. Now the job runs in the pendulum mode at a 10-in. stroke (maximum stroke on the Aida servo press is 16 in. ), compared to 14 in. before. The press now runs at 52 strokes/min., a considerable productivity boost compared to running at 40 strokes/min. previously. In addition to production jobs, the flexibility of the servo press has proven its value in tryout and troubleshooting tasks. “Our tooling department loves the servo press,” says Holtel. “When there’s time available on the press, we can use it for die development, since we can operate the press under full tonnage but at very slow speeds. We can watch the material form under very controlled but production-like conditions. “Knowing what we know now about servo-drive technology,” surmises Fledderman, “the next time we’re in the market for a new press we definitely will consider another servo-drive model. It’s like having three or four presses in one—we can run flat parts really quickly, and also perform deep drawing under very controlled conditions.